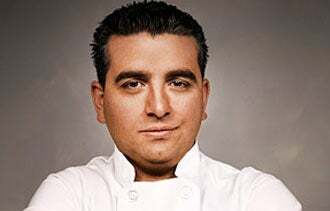 Italian baker Buddy Valastro of Carlo's Bakery in Hoboken, N.J., is the star of TLC's Cake Boss reality-TV series. The bakery makes a splash with its incredibly elaborate, creative cakes. But when the Cake Boss meets with customers, he shows the real secret to his business's success: He is there to fulfill customers' dreams, no matter how weird they are. His refrain: "I don't judge." People come to Valastro with wild ideas, and he jumps right on board to help them turn their concepts into cakes. On one Season 4 episode, a young Korean performance artist is getting 'married' in all 50 states in full traditional Korean-wedding attire -- and sometimes she marries things like a horse or, in Philadelphia, the Liberty Bell. New York will be her 50th state, and she wants Valastro to make her final wedding cake. If Valastro thinks she's crazy, he never lets on in front of her. He dives right in, creating a spectacular cake that pays homage to some of her past grooms, as well as groom number 50, whom she marries in Times Square. The cake is topped with a spot-on modeling-chocolate replica of her in bridal attire, leaving the bride speechless. When the New York City Beekeepers Association approaches him to create a cake celebrating their one-year anniversary, Valastro privately shares that he thinks owning bees in the heart of New York City is possibly ill-advised. But he's all business with the customers, creating an elaborate beehive cake, drenched in locally grown honey and covered in tiny fondant bees, that hangs from a cleverly concealed, chocolate-fondant-covered metal pipe that looks like a tree. Gay couples? Not a blink. A woman who wants to create a prank on her husband where the cake ends up on his face? No problem -- Valastro even has a special table constructed so one of his crew can hide inside to nail hubby with the cake when he leans over to read a poem inscribed on it. It would be easy to be judgmental about some of these requests, but that might send a prospective customer away without a cake. Buddy never lets it happen. Each time, Valastro dives in and gets his team on board to give their all to fulfill customers' wishes. The whole show is really a lesson in that oldest maxim in retailing: The customer is always right. If you do whatever it takes to make the customer happy, they will tell everyone they know about it, and send a mob of new customers to your door. Are your customers always right? Leave a comment and tell us your attitude.